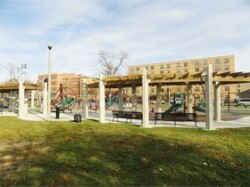 The founder of Casa Central Social Services Agency, Reverend Daniel Alvarez, a few years ago took the initiative of asking the politicians of the 26 ward to install a playground for children in Humboldt Park. At the time there was no playground anywhere in Humboldt Park for children under 12 years of age. After several attempts his efforts produced no fruit. But the reverend did not give up and continued to insist until he finally saw the product of his efforts thanks to the intervention and support of the new Alderman Roberto Maldonado. Throughout his life Reverend Alvarez always has a priority, the children, and that’s precisely why he wanted a playground in Humboldt Park for the children. “Once in a while one hears complains of people saying that children only watch television and play with electronic games and don’t come and play outside. I think we should take the children out and play with them in the park that’s healthy physically and psychologically,” said Alvarez. “This playground makes a big difference in this park and we feel good for the children because now they got where to play,” said the Reverend. The playground is at the corner of California Avenue and Evergreen Street.